Accessories are an important part of the modern fashion industry. They highlight your style and status. And will be a valuable part of your look. Watchers are elegant and simple at the same time. And you can make a good business with luxury watches store. Yet, you have to advertise your store and present your products at the same time. And nowadays the best way to do so is an e-commerce website. It allows you to develop an online store and accept digital payments. 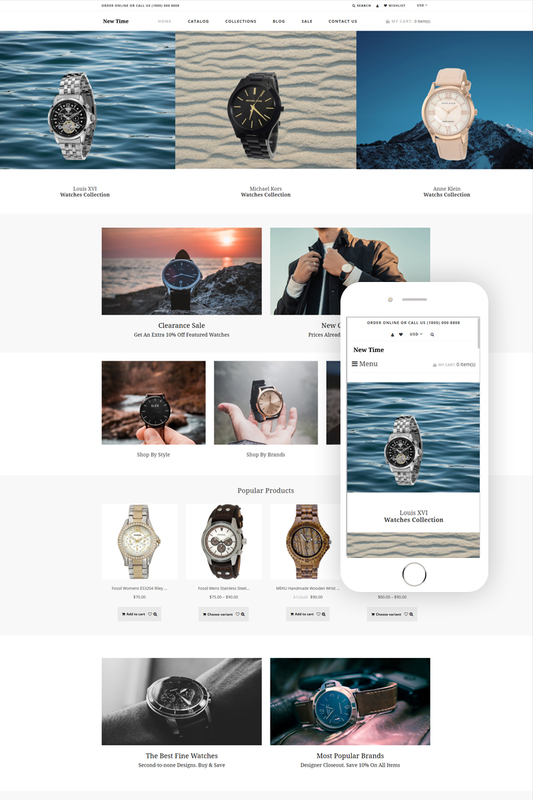 New Time was developed specially for luxury online stores and has clean, yet eye-catchy design. It also has Catalog, Sale and Collections category pages with many built-in pages you can use to sort your products and present them in the most preferable way. It has a blog and social options. Due to full Shopify plugin pack, New Time has cart, wishlist and currency options. It is well-structured, fast and reliable.